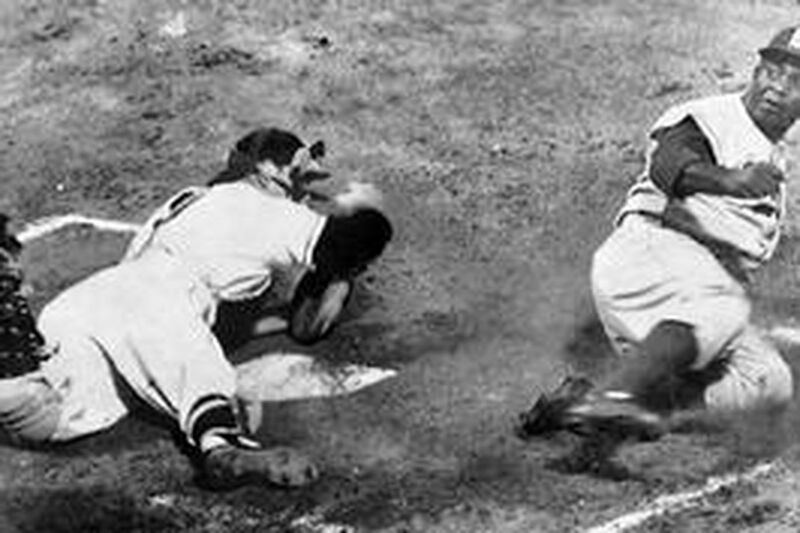 Jackie Robinson of the Brooklyn Dodgers steals home during a game against the New York Giants at the Polo Grounds in New York. An editorial Sunday incorrectly identified the baseball team of Boston Red Sox pitcher Daisuke Matsuzaka. Philadelphia's chapter in the saga of Jackie Robinson, who as a Brooklyn Dodger integrated Major League Baseball 60 years ago today, is one that the City of Brotherly Love would love to forget. Robinson said his first visit to Shibe Park on April 22, 1947, brought him "nearer to cracking up than I have ever been." Led by racist manager Ben Chapman, the Phillies cursed and taunted the rookie. After that, it seemed fitting that the Phillies would become the last team in the National League to integrate, bringing shortstop John Kennedy aboard 10 years after Robinson's groundbreaking debut. Only the Detroit Tigers and Boston Red Sox of the American League took longer to field a black player. One irony of today's celebrations of Robinson at ballparks across America will be that 60 years after he made history, Major League Baseball's present resembles its past. Oh, you'll see plenty of nonwhite players on the field today, but few were born in the United States. According to a University of Central Florida survey, only about 8 percent of major league players are African American. That's the lowest percentage in 20 years. At least now the Phillies have the brightest new African American star of all, Ryan Howard. About 60 percent of the players in The Show are white, 30 percent Latino. And with the success of stars such as the New York Mets' Daisuke Matsuzaka and Ichiro Suzuki of the Seattle Mariners, you can expect the percentage of Asian players to grow. The number of African American players keeps getting smaller because the pool has become so shallow. Black kids today don't play baseball as they did when Robinson, Willie Mays, Ernie Banks and Hank Aaron were growing up. They don't play baseball as much as when later stars Reggie Jackson, Kirby Puckett and Barry Bonds were growing up. There are a number of reasons for that, not least among them the expense. All you need to play hoops is one basketball, your everyday sneakers and an open net at one of probably several neighborhood courts. If you can even find a baseball field in your community, you'll still need bats, gloves and other protective equipment to play safely. Then there's the Daddy Factor. That's right, the absence of fathers in too many homes in America's inner cities, where so many star athletes get their start. After all, baseball became America's pastime not just because of its watchability but because the sport connected fathers and sons. A boy learned to throw, to catch, to hit from his dad. As they both grew older, tossing a baseball in the back yard was always something they could enjoy together - even when they seemed to have nothing else in common. Those nostalgic days are unlikely to return. Boys growing into men without learning baseball are unlikely to try teaching it to their sons. Kudos to Major League Baseball for its Reviving Baseball in Inner Cities (RBI) program, but by the time it reaches many youngsters, they're already too far behind in their skills development to catch the Latin and Asian kids who one day will be pros. But don't forget, Jackie Robinson cleared the bases for them, too.